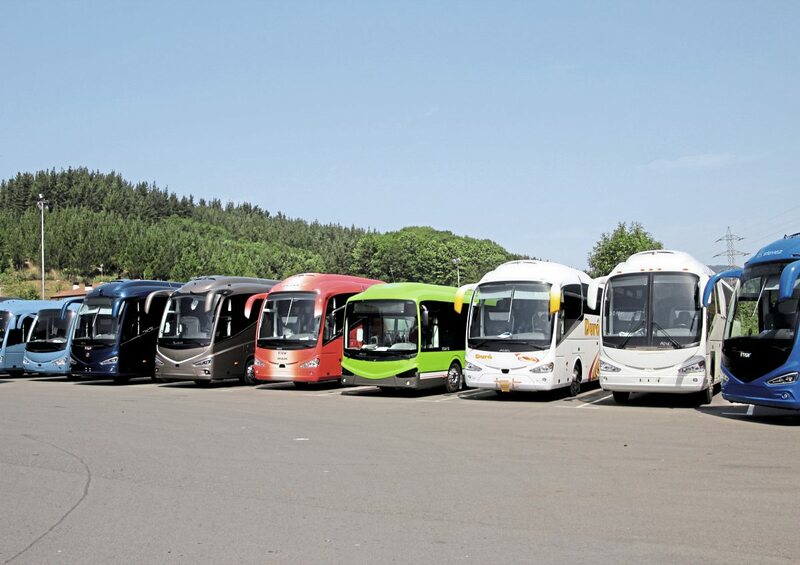 Demonstrating the breadth of the current Irizar range. So much is happening within the Irizar Group these days that regular visits to Spain are required in order to keep up with them. No longer is it just a case of taking in the main factory at Ormaiztegi, there is the integral mechanisation facility too, and this time journalists were the first to be given a sneak preview of the brand new Irizar Electromobility bus plant at Aduna, although this will not be officially opened until March next year. Unlike many other integral manufacturers, everything Irizar produces for Europe is also offered in right-hand drive, although there can be a time lag before certain models are introduced. Stuart Jones has just returned from this latest update with news of where the company is going and the policies and models it believes will take it there. Hector Olabegogeaskoetxea, MD of Irizar e-mobility. 2017 is set to be a good year both for the Irizar Group and our own branch of it, Irizar UK. For the Group. 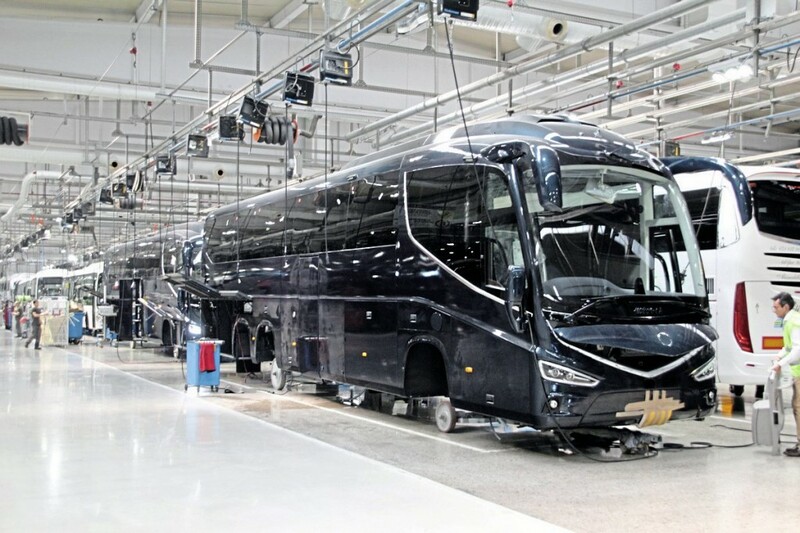 it will be the first time that sales have exceeded €600m/£538.1m (2016 €580m/£521.1m), while Irizar UK anticipates achieving a record sales figure of around the 80 mark. For the Worksop operation, the i6 remains popular, the top of the range i8 has established a niche for itself and there are new models scheduled to make their debuts at the NEC including the UK’s first commercially offered hybrid coach and a new version of the i6 called the i6S. What was once one cooperative company is now a group of seven autonomous companies with 13 production plants. Since a programme of expansion was commenced in the mid 1990s, it has established a thriving manufacturing operation in Mexico, another in Brazil that is currently concentrating on exports as the Brazilian market is challenging and likely to remain so, one in Morocco and an assembly plant in South Africa. Ventures in China and India have been tried and discontinued. 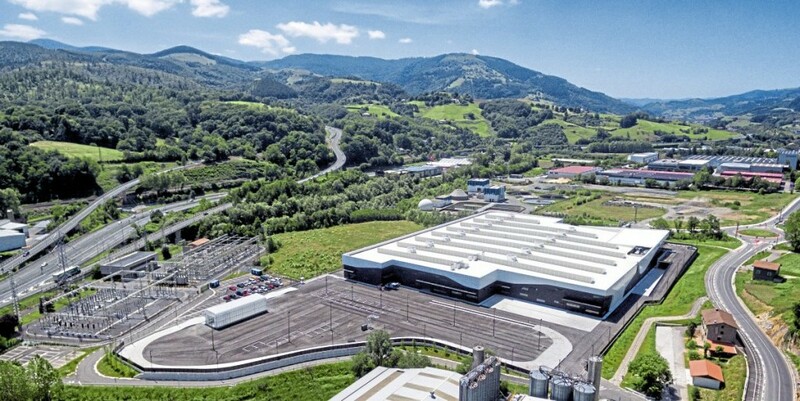 In Spain, the main plant at Ormaiztegi has been expanded and a new innovation centre called Creatio opened, with a smaller plant to handle the mechanisation of integral vehicles opened nearby. 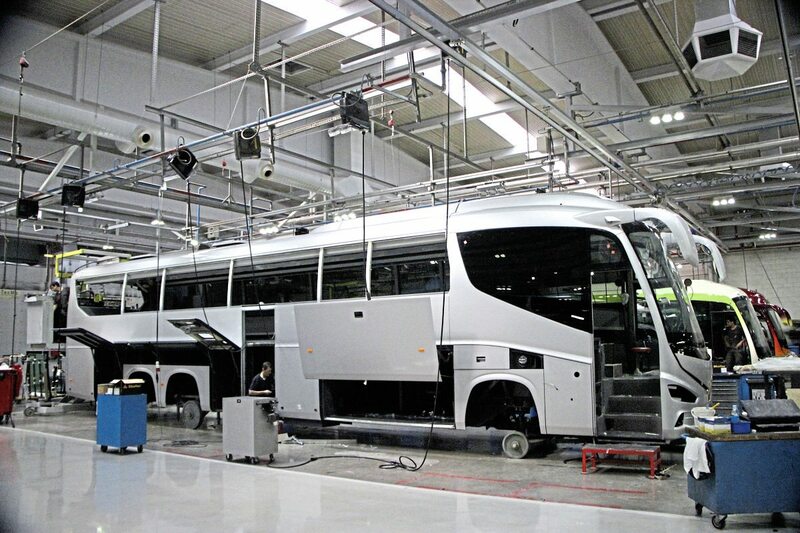 With a move into electromobility has come the construction of the new Aduna bus factory. Both Creatio and Irizar Electromobility are separate companies within the group. 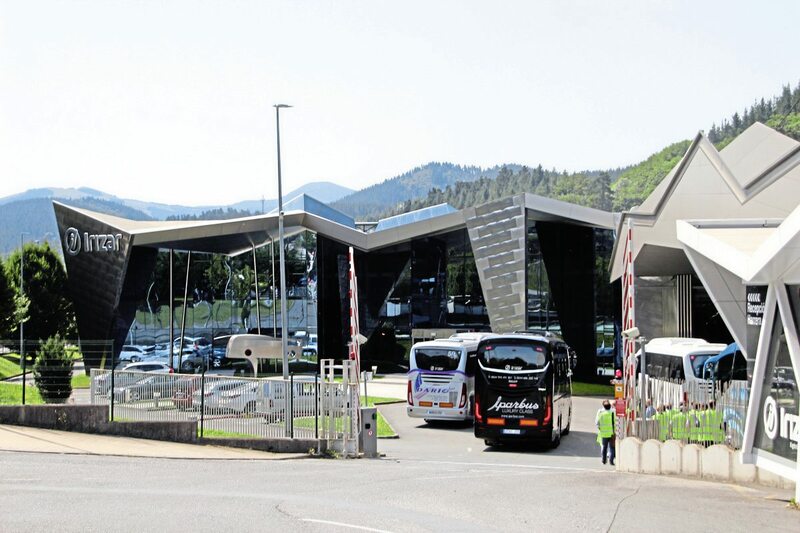 The exterior of the new Irizar electromobility plant at Aduna. It will be officially opened in March 2018 but is already building in small numbers. As well as opening these new plants, the group has expanded by means of acquisition to give it the expertise it has required to become a complete vehicle manufacturer. The purchases, all of which were already thriving, were: the air conditioning experts, Hispacold; door system designers and manufacturers, Masats; electric motor manufacturers, Alconza; transport management solution providers, Datik; and power electronics specialists, Jema. These have been big changes for the group and their extent is illustrated by the fact that ten years ago 100% of its income was from building coaches; today it is 70%, and 30% comes from other activities. This also helps underpin the future financially because to some extent it provides protection against quiet periods in the coach industry. It was only in 2011 that Irizar made the decision to enter the e-mobility market, starting from scratch to develop its own products. At this point it had never produced buses for the city bus market, though it did have an interurban low-entry diesel model in the shape of the i3, a number of which are running in the UK on Scania chassis. Irizar e-mobility was not created as a separate entity until 2016, drawing on the technologies developed throughout the group. It is headed by Hector Olabegogeaskoetxea. Integrals travel through the plant on trolleys and are mechanised after the entire body structure is finished. An i6 Integral in the mechanisation facility where the four-day process of installing and thoroughly checking the driveline is undertaken. The first electric product launched was the i2e, a 12m low floor city bus, which appeared in 2013. Two pre-production examples were supplied to TfL in 2015 as part of both party’s participation in the EU’s ZeEUS scheme. They originally ran on the 507/521 and are now deployed on route 108. 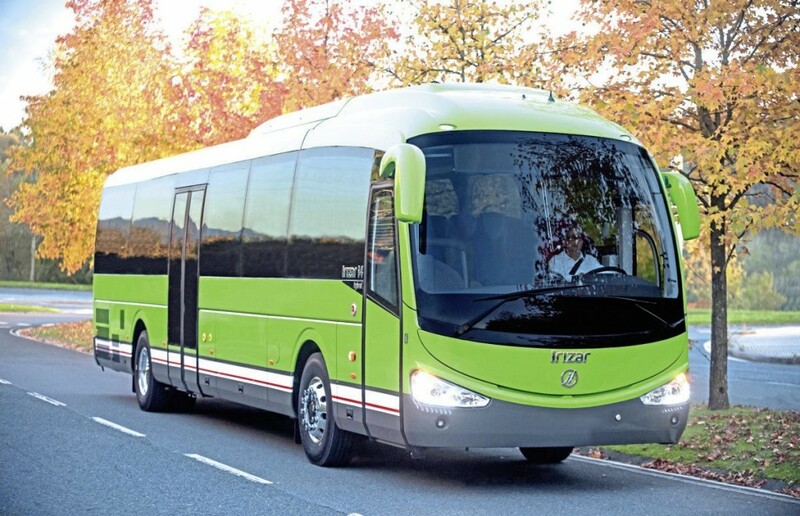 The 12m version has been followed by a shorter i2e10 10.78m bus as well as a BRT style articulated product, but this is not the limit of Irizar’s ambitions. 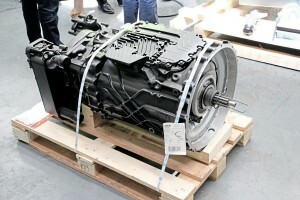 ZF’s Traxon automated transmission will shortly be offered in place of the ZF AS.Tronic. The 10.8m and 12m models have FIAMM SONICK sodium nickel batteries developing rated power of 180kW with an on-board capacity of 376kWh. This battery technology is immune to external temperatures, is capable of 1,500 cycles and has no memory. Recharging using a depot facility takes five to seven hours, although in normal operation not more than 83% of available charge is used. The drive system is the Siemens ELFA2 DB2016 and the axles are ZF, the drive unit being the AV133. They are said to deliver an 86% reduction in emissions compared with a conventional diesel bus when all factors are taken into consideration. Irizar claims a range of 200km to 220km on one charge. Irizar e-mobility is looking to develop electric urban vehicles other then buses (although no specific information on what these might be was revealed) as well as supplying components and systems to other companies. Among the products within the portfolio will be depot charging stations, opportunity charging systems, electronic control units (ECUs), batteries and electrical power train assemblies. The frontage of the Ormaiztegi plant. For Irizar e-mobility customers, it isn’t just a case of buying an electric bus; Irizar aims to accompany the customer throughout the project life cycle, not only offering up to 15 years’ comprehensive vehicle and infrastructure maintenance once it is delivered, but the whole process of developing vehicles suited to the customer’s needs, developing and installing charging stations, coordinating the civil engineering required, the provision of Cloud-based fleet management system and, if required, the arrangement of finance packages. If the customer wants, a complete turnkey system can be provided. Hybrid models offer the same capacities as standard diesels. Two right hand drive i8 Integrals for Ellisons on the finishing lines in the Ormaiztegi plant. 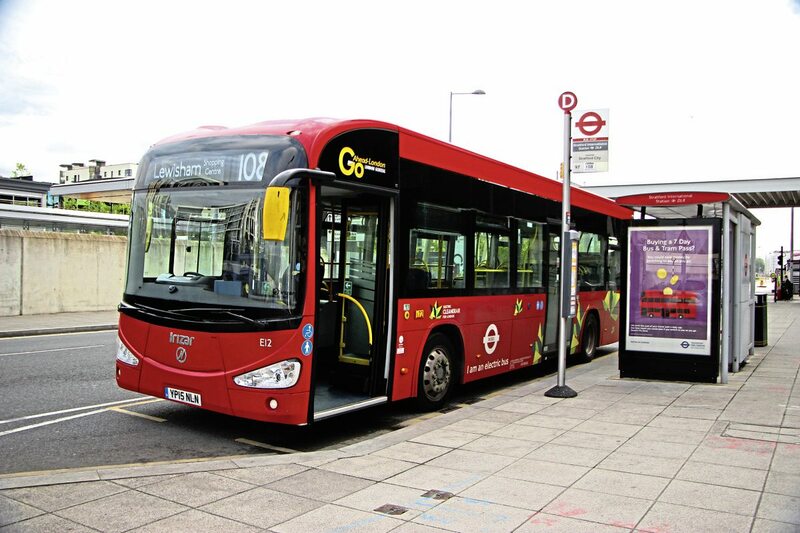 This i2e electric bus is one of a pair delivered to London in 2015 as part of the ZeEUS project and now employed on the 108. In developing its electric bus products Irizar envisages the market moving to electric buses in cities. It is not developing a hybrid city bus because it believes this will only be a temporary phase for the next four or five years on the journey to full electric. Already available on the i2e are telemonitoring systems which make identifying and responding to issues quicker and driver assistance systems that could also be the first step towards fully autonomous operation. Though we were not allowed to take photographs of the interior of the facility, we were shown around the new Aduna factory which provides 18,000 square metres of undercover accommodation on a plot slightly more than double that size at 36,750 square metres. There is room for further expansion should this become necessary. To the rear, skirting the car park is a test track with some very uncomfortable-looking surfaces to thoroughly test the vehicles upon. The building itself is built to a very high standard and makes the most of the available light to create good working conditions for the staff. All benches and tools within the plant are white as a statement about the cleanliness of electric propulsion. It is designed to accommodate rigid vehicles of up to 15m as well as articulated models. Construction is a mixture of steel and aluminium but no welding is undertaken on site, all modules that require welding being supplied complete by contractors. There is a sub assembly area that is not very busy yet, concentrating on ensuring the quality of designs before production of them is outsourced. At the time of my visit, 26 i2e buses had been delivered to customers over a three-year period, but the plan is that the build rate will now increase markedly with the production facility in place to achieve this. 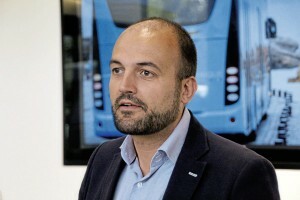 The biggest order so far supplied is one of six for Marseilles, but an order has been placed by Bayonne in southern France for a fleet of 18 i2e18 TramBus BRT style artics. It was revealed during our visit that Madrid has also placed an order for 15 buses to be delivered prior to the year end. Three i2es are running in San Sebastian, and we did catch a glimpse of one of them in service during the trip from the hotel to the plant. Working a single shift, the plant will be capable of completing two buses a day. To accomplish this, it is envisaged that the workforce will grow to between 300 and 500 over the next five years. described to readers on numerous previous occasions so I won’t go in to great detail here, but the six lines were all busy and it was interesting to see how much greater the percentage of integrals is occupying them. It is easy to tell which buses are on chassis and which are integral because the integrals remain on large metal wheeled sleds throughout the build and finishing process, whereas the chassis are complete at the end of the line. There was a good mix of models with the i8 and i6S much in evidence as well as the i3 bus, i4 and i6. I always find the geographic spread of the customers fascinating with batches on chassis for Israel, a large batch of i8s for a French customer and examples of the very different specification for North America also noted. Among the UK coaches I saw were a pair of high specification i8s for Ellisons. Plans are in hand to further streamline the supply of parts to the line in order that a significantly higher percentage of parts are delivered on a ‘just in time’ basis. During the August shutdown period, the opportunity will also be taken to install a new flooring system that will help make the workshop easier to keep clean, though it is already significantly cleaner than many coach building plants I have visited. As well as the main Ormaiztegi plant, there is an additional one a few kilometres down the road where the mechanisation of integrals take place, a process that takes four days once the body structure has been completely finished, the last two of which are primarily taken up with inspection, checking and road testing. Here we saw the preparation of the drivelines which are mounted on double damped cradles within the rear of the vehicles. We also saw the first ZF Traxon automated transmission to be supplied to Irizar for use in conjunction with a 390kW/523hp DAF MX13 engine allowing torque to be increased by 7% to 2,600Nm. The Traxon, which has a predictive capability, will replace the AS.Tronic in time. The standard options are currently ZF AS.Tronic automated or full automatic EcoLife transmissions with either DAF/Paccar MX11 or MX13 units. Among the coaches going through mechanisation was the first i6S integral of two for The Kings Ferry. This will appear in Birmingham and be the first i6S for a UK customer. Over 1,000 integrals have now been built and the recent launch of the product range in Spain is going well. Incidentally, of 220 i8s built for Europe, roughly half are of integral manufacture. Having joined the operator familiarisation trip that Irizar UK organised to Spain in January 2016 to mark the launch of the i8, and mindful of the forthcoming participation of the i8 Integral in the Coach Euro Test in conjunction with the International Coach of the Year competition, I will not go too heavily into describing the model. As a brief reminder, in the most powerful current specification the driveline matches the DAF MX13 375kW/510hp unit developing peak torque of 2,500Nm at 1,000-1,450rpm with the ZF AS.Tronic 12S.2700 automated gearbox with ZF Power Intarder. The axles are the ZF A132 on the drive axle and the independent RL82C on the front and tag axles, the latter a steering unit. We travelled on a 14.07m long version with a passenger capacity of 56, centre sunken toilet and a 13.5 cubic metre luggage compartment. It was fully loaded with equipment but it was choice of materials and the comfort of the i8 seats I particularly liked, as they fitted my contours perfectly. These seat units, complete with USB chargers, perforated leather trim sections, all age seatbelts, trays, nets and centre and aisle armrests, are not available on other models. The first i6S Integral for the UK is to appear at the NEC in October. It is one of a pair for The Kings Ferry. Having travelled for two days on one or other of the two i8s provided for us, my final coach journey of the visit was on a VIP specification Irizar PB on a Scania chassis. This really brought home just how different a coach in quality terms, as well as passenger appeal the i8 is. They seemed a lot more than 17 years apart, although I confess I still have a soft spot for the PB which was such a bold design statement when it was launched. Though I still appreciate the sculpted edges of the racks, the multi section units rattle loudly, the screen height means you can’t see much out of the front screen, the sloping side window pillar is similarly poor for vision and the panel fit is inconsistent, though the seat design still takes some beating. Although Irizar has no plans for a hybrid city bus, it does see a need for a hybrid coach or interurban because these operations do not lend themselves so readily to electrical propulsion. It has already developed the i4 and i3 for hybrid applications, having launched them at the recent FIAA show in Madrid. A right-hand drive i4 parallel hybrid to full DDA specification with 57 seats, two entrances and a Masats step lift at the centre door will be launched at the NEC this year and is currently about to start tests with UK operators. Unlike Irizar’s diesel products, which employ DAF MX engines, its parallel hybrid offering features a six-cylinder 6.7-litre Cummins unit delivering 300bhp and torque of 1,100Nm. This is linked with a six-speed Eaton-Fuller robotic gearbox with inverter, a water cooled EDRIVE (44/65 KW) electric motor and MGL lithium-ion batteries. Development of an alternative version with a larger nine-litre Cummins unit delivering 370bhp/1,600Nm is under consideration, but if the go ahead is given, availability will still be at least a year away. Built on the same production lines as conventional coaches and with the hybrid driveline housed within the same envelope as a diesel, the parellel hybrid i4 offers exactly the same capacity as a diesel in both seating and luggage terms. Weight is comparable with the MX11 powered diesel too and there is nothing additional on the roof. The downside is an on-cost of around £70,000 compared with a diesel and the fact that, with a parallel system the engine is continuously idling so it could not run in zero emission mode. A serial hybrid would not idle in this way but would be nearly that of a full electric, requiring full electrification of all the systems. The indications from current testing in service are that the parallel hybrid system results in a fuel saving of over 20%, though it is not yet clear whether this is 21% or 29%. 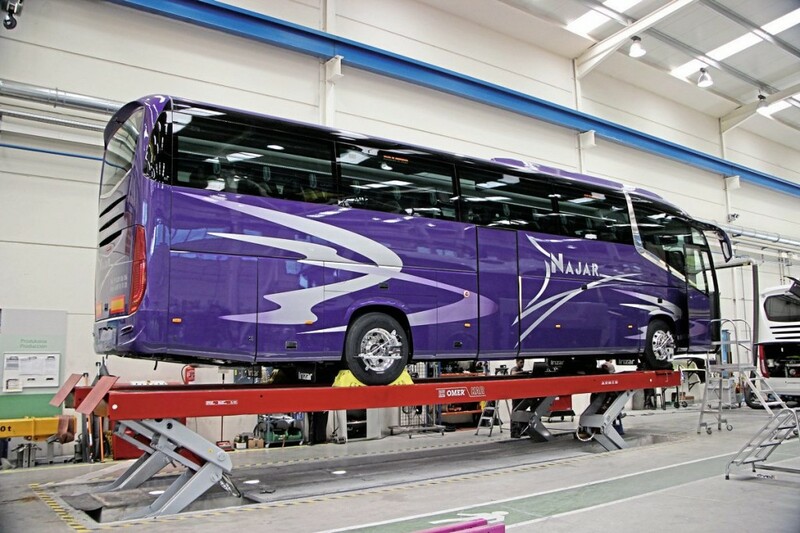 By any standard, Irizar is a tremendous success story. In the past 25 years it has gone from a low of building 250 coach bodies a year at one plant, to a thriving group building complete vehicles with plants in five countries and over 3,000 employees. The transition from coachbuilder to complete manufacturer is a difficult one and while sales of integral models already represent one third of production, there is still considerable dependence on chassis manufacturers. It may seem brave to be investing so heavily in e-mobility at the same time as expanding integral manufacture – and to some extent the building of such a large factory to serve an emerging market is a leap of faith – but if Irizar can pull it off it will have total control over the electric buses it builds in a way that it cannot with the bought-in drivelines of diesel powered products. With the i2e in its various forms, the i3, i4, i6, i6S, and i8 as integrals and an undiminished offering on chassis, Irizar has never had such a broad range to offer. On top of this it has diesel, parallel hybrid, serial hybrid and electric to offer. Though it cannot predict how quickly the market will change, it believes it is ready as a strong independent OEM to meet whatever the customer’s needs are.